Neverwinter Nights 2 is a 3D role-playing game set in the Forgotten Realms. The fantasy game art for creatures closely, if not exactly, matches the Dungeons & Dragons 3rd Edition roleplaying game and some of it was probably simply imported from the previous game, Neverwinter Nights game. This page of fantasy game art from the Neverwinter Nights 2 computer roleplaying game has general information on the half-drow playable race. Half-drow are often just as dark-hearted as their elven parents, but with a bitter resentment that comes from knowing that they are considered second-class members of drow society. Despite this, good half-drow are much less rare than good drow. 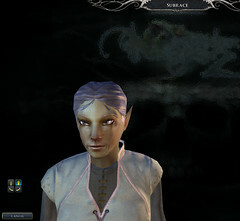 Half-drow have dusky skin, silver or white hair, and a broad range of eye colors. 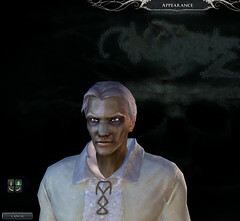 Except for a slight change in racial characteristics (half-elves have low-light vision, half-drow have a superior version of that), the major difference between half-elves and half-drow is the character model in the game.